The first lecture of 2019 in our popular 'Scholar'd for Life' series! Professor Emeritus Jim Leary presents a multi-media lecture on the vibrant yet largely neglected folk/ethnic/roots music of diverse peoples in Wisconsin and the Upper Midwest and what that tradition tells us about the American experience. Join Leary for an evening enlivened by sounds and images from his recent Grammy-nominated productions: Folksongs of Another America: Field Recordings from the Upper Midwest (2015) and Alpine Dreaming: The Helvetia Records Story, 1920-1924 (2018). Copies of his latest book, Folksongs of Another America: Field Recordings from the Upper Midwest, 1937-1946 will be available for purchase and the evening will conclude with a book signing. From UW Press, publisher of Folksongs of Another America: "Challenging and considerably broadening popular and scholarly definitions of American folk music, Folksongs of Another America recovers the diverse, multilingual traditions of immigrant, Native American, rural, and working-class performers in America's Upper Midwest during the 1930s and 1940s. The book extensively documents 187 tunes and songs in more than twenty-five languages, with full original lyrics and English translations, biographical notes on the performers and field workers, and many historic photographs. Spanning ballads, hymns, laments, versified taunts, political anthems, street cries, and recitations, these performances were captured during a transformative era in American history and culture." 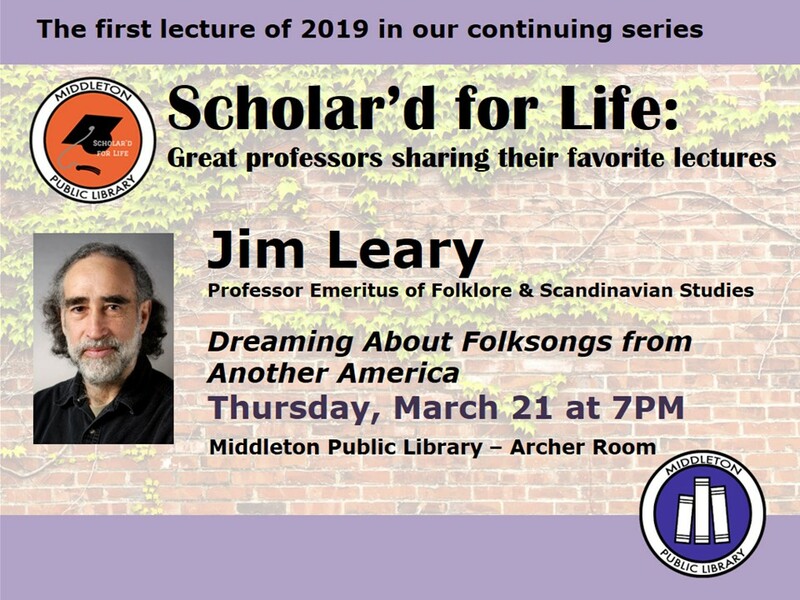 Jim Leary is a public folklorist who was born and raised in Rice Lake in northwestern Wisconsin. He earned a B.A. in English Literature, Notre Dame (1972); an M.A. in Folklore, University of North Carolina (1973); and a Ph.D. in Folklore and American Studies, Indiana University (1977). Since the early 1970s his research has focused on the traditional songs, stories, customary practices, and handwork of indigenous and immigrant peoples and their mostly rural and working class descendants in America's Upper Midwest, resulting in numerous museum exhibits, folklife festivals, public radio programs, documentary sound recordings, films, essays, and books. Leary is a faculty member in the Department of Comparative Literature and Folklore Studies and in the Department of Scandinavian Studies. He is also affiliated with the Celtic Studies Program, the Labor and Working Class Studies Project, and the joint UW-Madison/UW-Milwaukee Building, Landscapes and Cultures Program. Director of UW's Folklore Program from 1999-2009, Leary co-founded and currently directs the Center for the Study of Upper Midwestern Cultures, a populist public humanities center devoted to research, the development of archival collections, and public programs regarding the languages and folklore of the region's diverse peoples. Scholar'd for Life is a lecture series presented by the Middleton Public Library in partnership with the UW Madison Speakers Bureau. Taking the "Wisconsin Idea" as its starting point, this series aims to promote lifelong learning, intellectual curiosity, and engagement between academics and the community as a whole. More information, including recordings of past lectures, at www.midlibrary.org/sfl.